There is nothing to thank the PF government for reversing their earlier decision to export maize barely two months or so ago. What is there to thank a government of flip flops, bleeps and blunders. A government run on the basis of try and error and ‘let’s see whether it works’ ideology. When we tell citizens that the PF have no idea on how to run government, the PF cadres and their leaders come back howling and bawling and screaming ‘blue murder’. Our visionary party President Hakainde Hichilema advised and forewarned them prior to their misguided decision, that allowing maize exports was one typical PF way of perpetuating an illegality that is devoid of coherence and coordination which a sane government should not even have pursued. The decision by the PF regime to allow maize exports amidst a looming hunger situation in the country due to poor yield was completely uncalled for and unwise. Actually, we view it as one of those selfish decisions where they wanted to make a quick buck for their individual pockets through corruption. We know they won’t thank Mr. Hichilema for the visionary advise against exporting maize, because of their usual arrogance and pride and in any case we don’t want any accolades from the PF because, its simply not in their DNA. As UPND, we have consistently been offering alternative economic policy guidelines to the nation though the PF reject them for political reasons resulting in disaster and economic retardation. We shall continue offering the nation what we believe are the best policies and if the visionless PF leadership wants, we can give them a complete economic blue print to salvage this sinking PF titanic regime. But in the meantime, PF must immediately pay our farmers for last season’s crop supplies to the Food Reserve Agency (FRA). 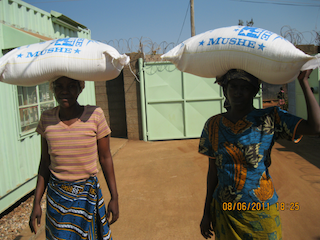 We are actually disturbed with reports that PF are reselling maize to the starving villagers at more than K110 per 50 kg bag when they bought it at K60 per 50 kg bag and yet the farmers have not been paid for their supplies. The only places where maize and mealie meal is being dished out freely is in the bye election areas as an inducement for votes. Perhaps it’s high time there was an election in the whole country so that our starving citizens can access free mealie meal, cooking oil, meat, and other food stuffs from the PF party which now has more money than the government treasury. This is especially that mealie meal prices have gone way too high for majority of our citizens, yet the PF party have the capacity to dish out freely.